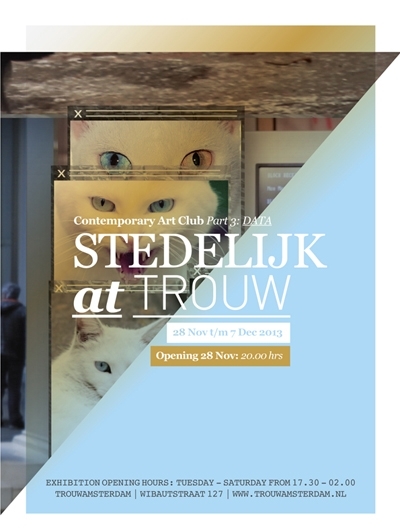 Last weekend the third and last edition of Stedelijk at Trouw kicked off. No better way to check out art where you normally dance the night away. This collaboration between our museum for contemporary art and Amsterdam’s ever-advancing nightclub composed an exhibition around the theme DATA. Spread through De Verdieping and the smoking area you can see the video works of three artists. This marriage between a night shelter and contemporary art is definitely worth a visit, since this is the most low-key museum you’ll find. DATA stands for database, or the enormous amount of mini-pieces of information we and the internet collect. Since I own a smartphone I send just as much photos and videos as messages to my friends. Elizabeth Price, Camille Henrot and Hannah Perry all have a different approach to this modern phenomenon. Perry made a very 21st century piece, which looks like a hip-hop music video, and Price surprised me with her montage where she brings together multiple stories. All in all it’s difficult to describe, you should take a look yourself.